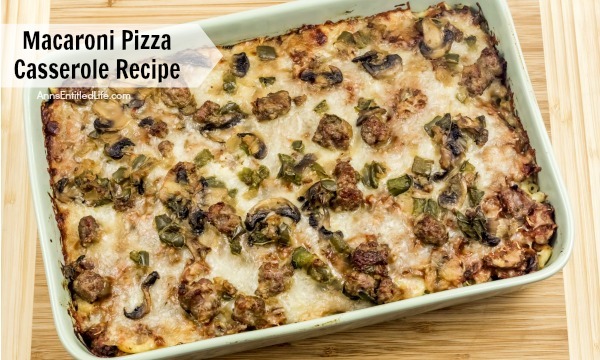 This baked Macaroni Pizza Casserole Recipe is an easy to make, crowd-pleasing pizza-tasting casserole that is the ultimate in comfort food. Your whole family will love it! Hubby was telling me about this awesome dish his mom used to make when he was a kid: Macaroni Pizza Casserole last month. He continued to talk about it for a few weeks while he asked me if I had ever heard of it (I hadn’t), if I was interested in trying it (I was) and if I would cook it if he got me the recipe (I would not). After a few weeks of whining and cajoling and getting no where with me agreeing to cook a recipe I had never heard of nor concocted myself, Hubby finally broke down and made the Macaroni Pizza Casserole himself. It was fabulous! 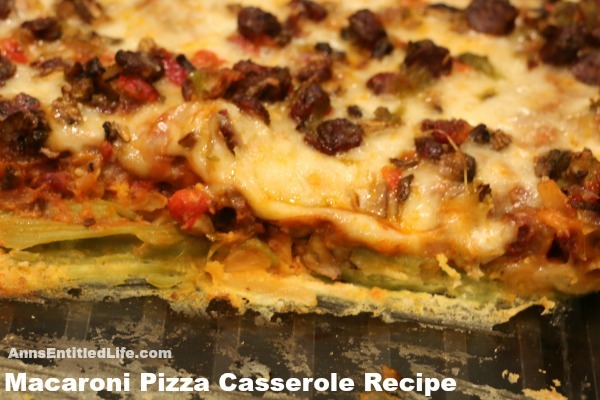 He’s welcome to make this Macaroni Pizza Casserole anytime! Heck, I may even make it myself next time. It does taste like a pizza! It holds up quite well in the fridge, and like so many pasta dishes, actually improved the next day. That is a cut-away view in the pan. It serves up easily out of the pan using a spatula. Note: Hubby used gluten free noddles, but regular noodles will work just fine. His mom used regular elbow noodles when he was growing up. 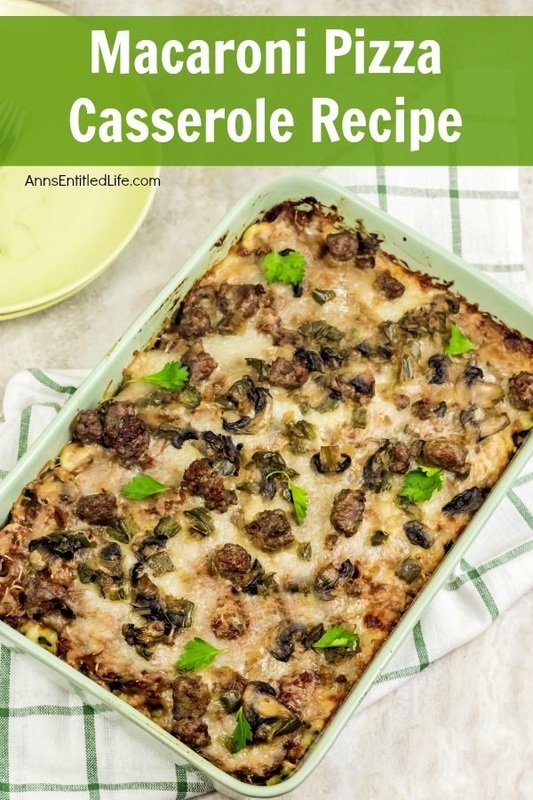 • Grease a 13″x9″ casserole dish with a non-stick spray; set aside. 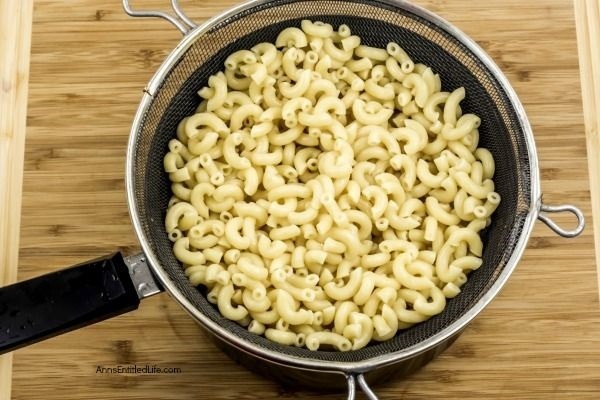 • Cook macaroni until just tender, drain well. 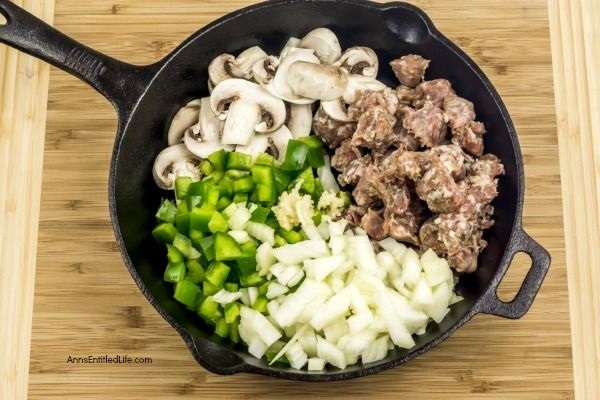 • In a large pan on the stove over a medium heat, sauté until brown sausage, onion, garlic, green pepper and mushrooms; drain off any fat. • Remove one cup of the meat and vegetable mixture, reserve for later. 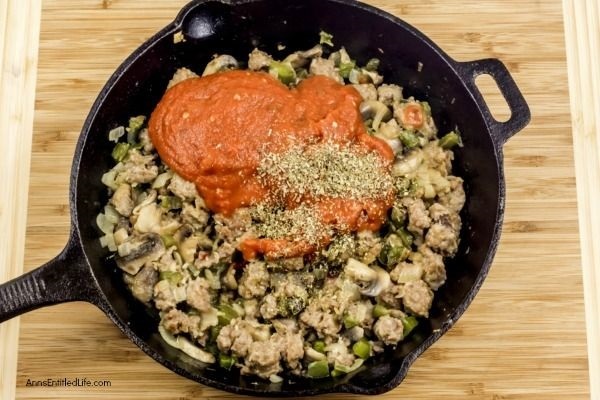 • Stir pasta sauce and oregano into the meat mixture left in the pan; simmer for 5 minutes. 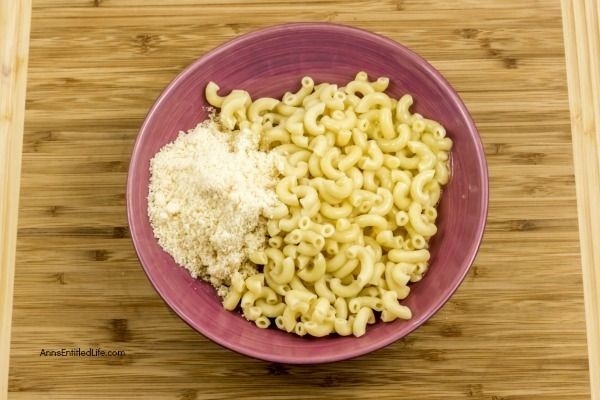 • Combine macaroni, beaten eggs and Parmesan cheese. 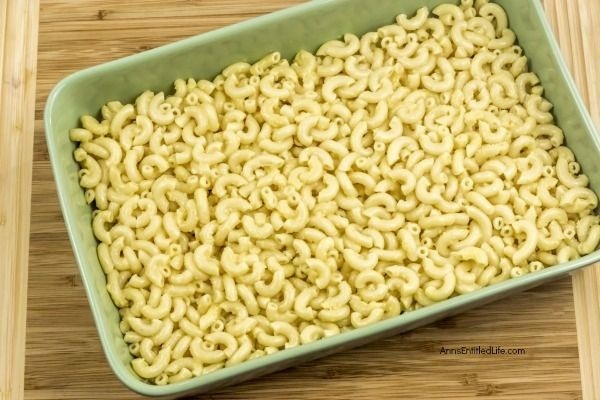 • Cover the bottom of your greased 13″x9″ pan with the macaroni mixture. 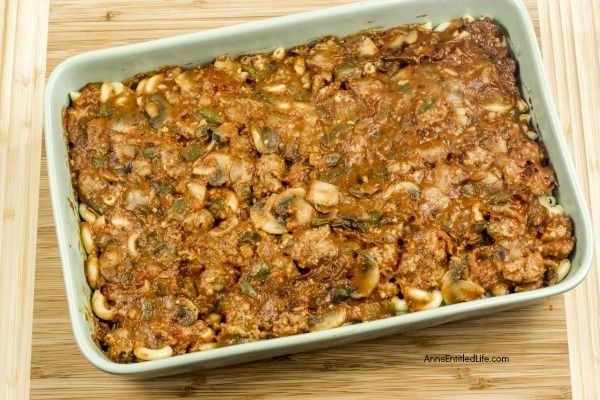 • Spoon the meat sauce mixture from the pan on the stove evenly over the macaroni mixture. 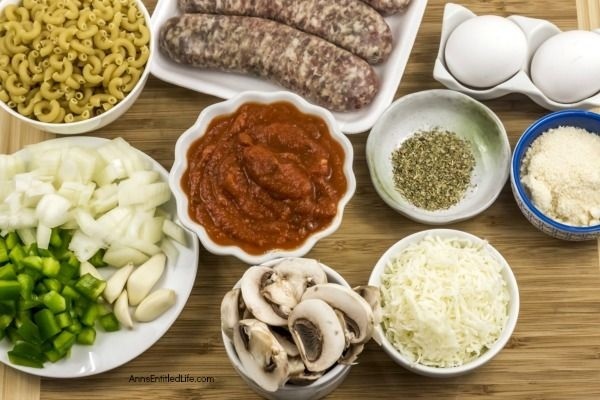 • Top with mozzarella, and then the reserved cup of meat and vegetable mixture. • Bake in a preheated 350° oven for 25-30 minutes until cheese is lightly browned. 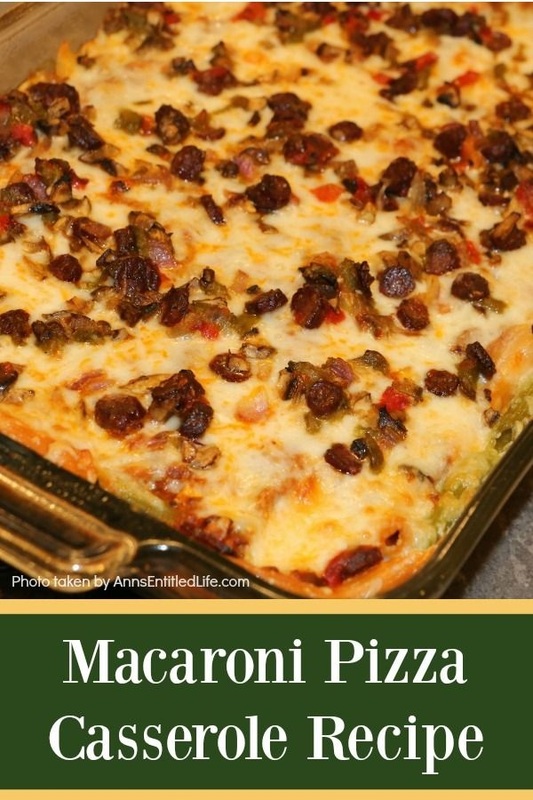 • Remove Macaroni Pizza Casserole from the oven and allow to stand for 10 minutes before serving. • Note: you can vary the toppings if so desired. 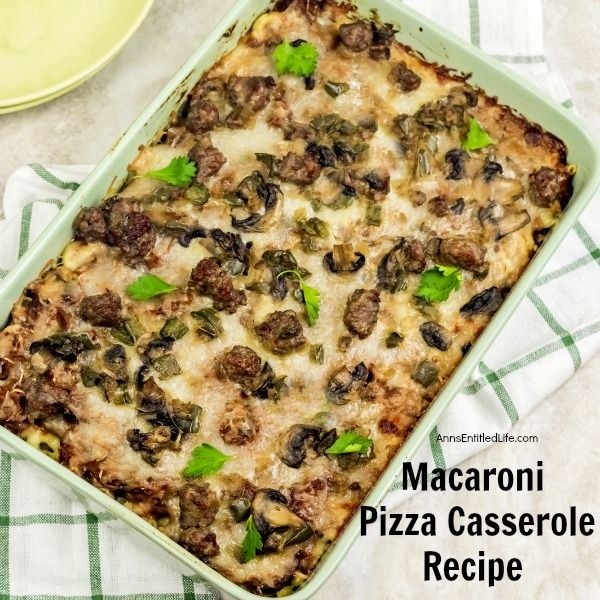 • To print the Macaroni Pizza Casserole Recipe, click here. 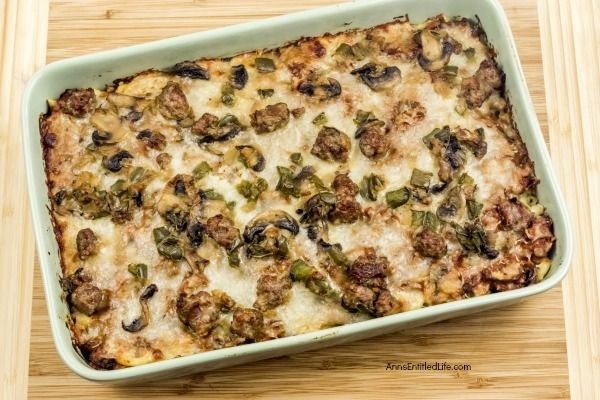 • Chili Relleno Casserole Recipe – A classic Mexican dish transformed into an easy to make casserole. 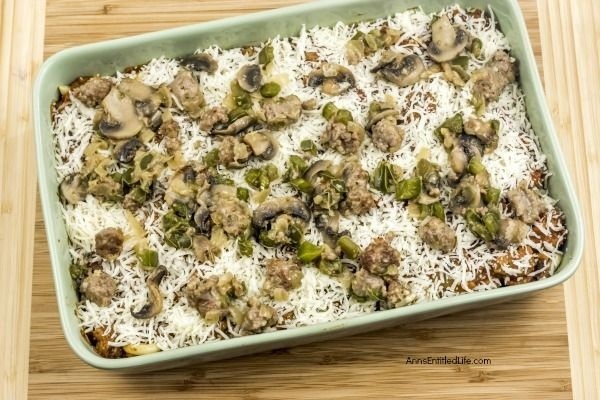 Your entire family will love the cheesy, spicy goodness that is this Chili Relleno Casserole Recipe. 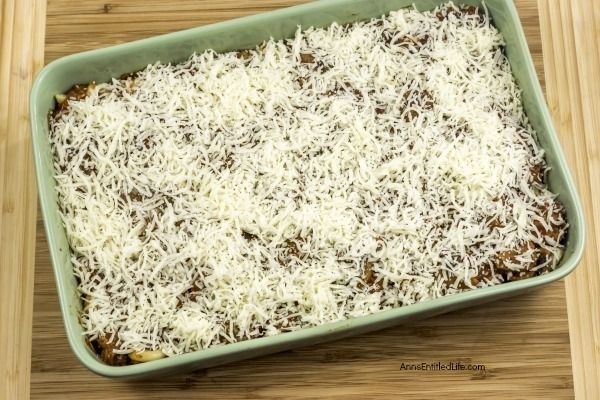 • Cheesy Burrito Casserole – A classic Mexican-American dish transformed into an easy to make casserole. Your entire family will love the cheesy, beefy goodness that is this Cheesy Burrito Casserole. • Easy Leftover Ham Casserole Recipe – Got leftover ham? This is a delicious, easy to make leftover ham casserole recipe! This homemade ham casserole freezes very well too. This combines so many of my little ones favorites – it’s going to have to make an appearance at dinner soon! This looks awesome! I love pizza! I’ll definitely have to try this! Thanks so much for sharing and for linking up with our Living With Style Linky Party! Have a great weekend! Lol…that’s funny that your hubby brokedown and made it himself. 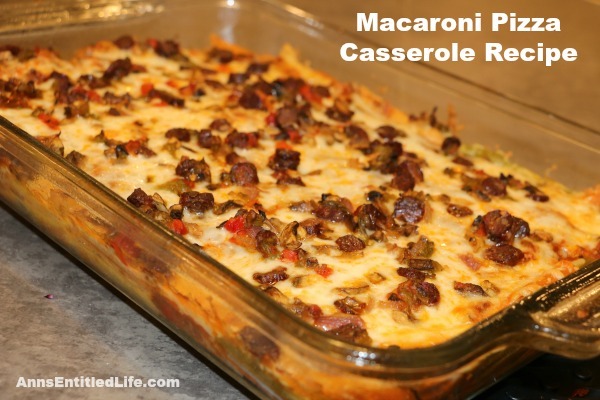 I haven’t tried a pizza macaroni casserole I’ve like yet, so I’m going to give this one a try. Thanks for sharing on Merry Monday. Pinned it.